The Athens Plow Company strives to maintain a continuing commitment to service, ATHENS offers an availability and quality that cannot be matched. The Main Frame is constructed of ¼" thick steel tubing and ½" thick angle which is truss-braced and reinforced to resist twisting and bending. 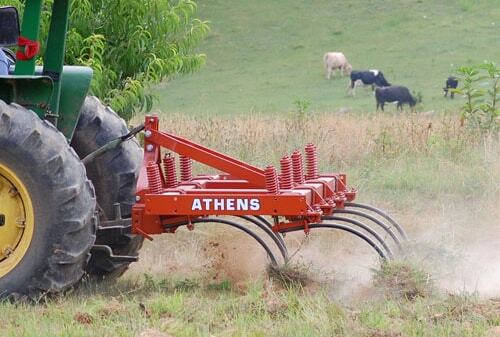 Compact design allows for easy lifting, straight pulling, and excellent maneuverability in small fields and around close obstacles. Axles are made from 1.13" square cold rolled steel to insure straightness and to keep bearings and disc in alignment. Gang Frames are constructed from 3 x 3 x ¼" structural steel tubing. Flangette Ball Bearings on the 52 are greaseable and have triple lip seals. Angle of Cut adjustments can be made from 15° to 18° depending on your need for penetration and aggression. Bearings: Strong relube Quadraseal Ball Bearings on the Model 93 mean long life and less downtime. The Spring Bearing Hangers feature the Double-Row Tapered Roller Bearings with unsurpassed durability. Choice Of Discs: 22" or 24" Cutout or Smooth Discs are offered on the Model 93. The disc blades are made from the highest quality steel for superior cutting and durability. 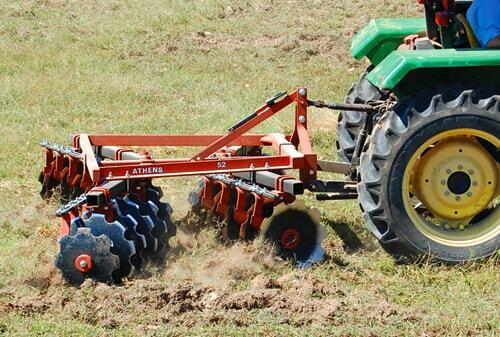 Bearing Hangers: From Rigid Bearing Hangers for pasture land, to Spring Bearing Hangers for plantations, the Model 93 is the perfect choice for smaller farms plantations and ranches. The Heavy Duty Frame is constructed of structural 4" x 4" steel tubing welded into a unitized one-piece frame. All high stress areas are reinforced to resist bending and twisting. The Vertical Clearance between the chisel point and the bottom of the frame is 26" or 32" depending on the tine size. 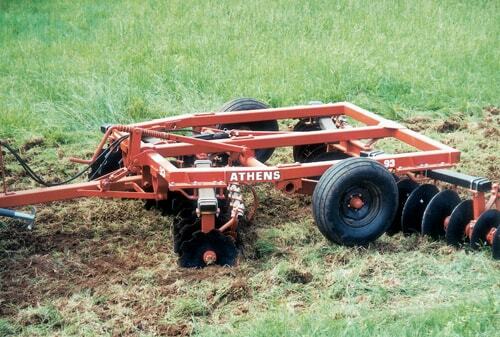 The Rigid Tine Pivot Assemblies are used where rocks are not a problem. Available on 5' and 7' 2-Bar units only. The Spring Tine Pivot Assemblies feature dual springs made of ½" oil tempered steel for strength and durability. The spring mounts are cast with internal and external helicals that match the ends of the springs. As the spring is stressed, the load is distributed evenly out the entire length of the spring. This distribution aids in avoiding stress concentrations.